After a few days of R&R in Krabi Town, I shuffled up the road to the resort hub of Ao Nang. This tourist trap of a beach town is a friendly spot, but saturated with the “you like buy tour, souvenir, t-shirt” hustle. For 1000baht (about $30usd) I jumped on a full day island hopping tour. We visited Viking Cave, Maya Beach (pic above) where the movie “The Beach” was filmed, Monkey Beach and Ko Phi Phi Don–a legendary diving town in the Andaman Sea. Despite heavy applications of sunscreen and a concerted effort to hydrate, my Jamaican pelt burned like clay in the kiln. The craggy limestone peaks of this region are as good as advertised. I snorkeled through groupings of colorful fish, and chilled with unafraid beach-dwelling monkeys all day long. A fine time, for certain. 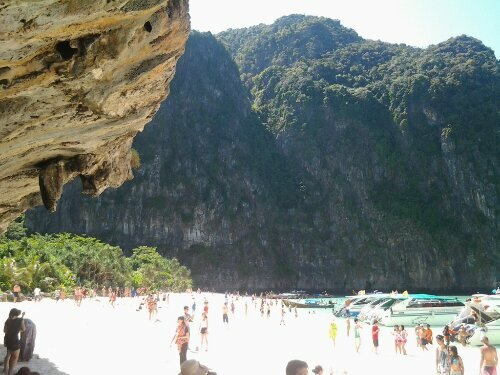 Posted in Transworld TourTagged ao nang, ko phi phi don, maya beach, transworld tourBookmark the permalink.